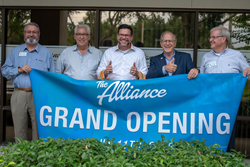 National Agents Alliance, aka The Alliance, officially opened its first satellite office during a ribbon cutting ceremony on Wednesday, with help from the Lakeland Chamber of Commerce, Lakeland Mayor Bill Mutz and more than 175 agents on hand. NAA President and CEO Andy Albright, center, is joined by members of the Lakeland Chamber and Mayor Bill Mutz, far right, during a Ribbon Cutting at its new Lakeland, Fla. office on Wednesday. The new 6,000 square foot office located at 2525 Drane Field Road was opened in an effort to help The Alliance grow and expand outside of its corporate footprint in Burlington, N.C. The new Lakeland office is a major investment made by The Alliance to further the efforts of agents in the Orlando and Tampa area, while also beefing up the number of resources available to agents in Florida. After a few remarks from the Chamber of Commerce and Mayor Mutz, attendees cut the ribbon to open the office and enjoyed a social with food and drinks to end the event. Mutz said Lakeland is a city that cares about helping people and welcomed The Alliance to its new home away from North Carolina. Andy Albright, President and CEO of The Alliance, said selecting Lakeland as the first satellite office was based on the general population there, the number of active agents with The Alliance in close proximity and because of the volume of leads in the area. The Alliance will also hire 20-plus full-time corporate staff to work in Lakeland. Dustin Perkins, who formerly worked with the Lead Performance Team at The Alliance headquarters in Burlington, N.C., has been promoted to Chief Lakeland Officer and will manage day-to-day operations in the new office. Perkins, who moved to Tampa in May, has been with The Alliance for two-and-a-half years. The Lakeland office boasts 22 desks in an open area similar to the Agency Build Task Force in the Burlington, N.C. headquarters, eight offices, a break room and a meeting space that can hold 100-plus guests. Other amenities include numerous TVs and two smartboards in the new space. The Alliance made major renovations to the office by knocking out 13 walls, installing new floors, replacing an old ceiling and by adding more offices to maximize the space. “We wanted an office that really mirrored what have done at our office in Burlington,” Albright said. “This is a major investment by us to help The Alliance expand and add new talented staff." Robbie Craft, Chief of Sales with The Alliance, said he believes Lakeland will be the first of several satellite offices that The Alliance opens moving forward. National Agents Alliance is an innovative lead generation and marketing organization that sells life insurance, annuities, and other financial services products through more than 7,000 active independent sales representatives in 50 states. Focused on serving middle-income families, National Agents Alliance is the No. 1 United States provider of mortgage protection insurance and offers a broad array of other affordable products from highly regarded companies such as Mutual of Omaha, Transamerica, Foresters, etc. Since its inception in 2002, National Agents Alliance has helped more than 1.2 million families successfully apply for more than $123 billion in life insurance coverage. For additional information on this topic, please call Mac Heffner at 336.227.3319 x1189 or email Mac at mheffner(at)naaleads.com. The Alliance opened its new Lakeland, Fla. office on Wednesday with a Ribbon Cutting ceremony.